Jim’s Blind Cleaning offers an expert service to help look after your precious window coverings and more. We specialise in cleaning commercial and domestic blinds including ‘drop-arm’ (flat) window awnings. We also offer a handy ‘come to you’ blind repairs service. Our blind cleaning & blind repair services are carried out by professionals who are fully trained and very reliable. As professional blind cleaners we understand the value of your blinds to your home or business. We therefore believe in providing a thorough clean which also helps to protect your investment and ensure it looks and feels great! Jim's Blinds full range of services include cleaning and repairs to your existing blinds or alternatively, we are able to supply new blinds. Whatever your needs, call Jim's, the name you can trust! 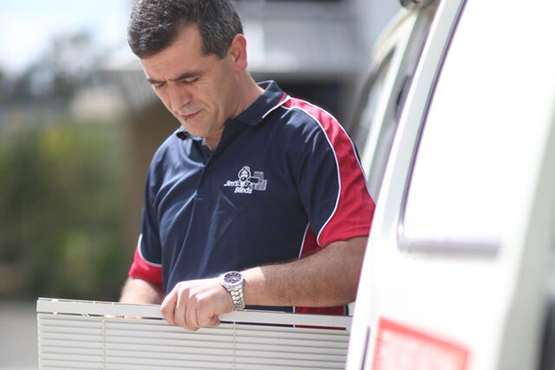 For decades, Jim’s Cleaning has maintained its position as Australia’s leading home and commercial provider. We save our clients time and energy by applying an unmatched standard of quality to each assignment. Cleaning the blinds is a drawn out task that most would rather avoid. Unfortunately, frequent neglect can lead to a number of hygiene, health, and aesthetic issues. Rather than subjecting yourself to a storm of dirt, dust, and debris, contact us for professional blind cleaning that accommodates your busy schedule. Ultrasonics is a revolutionary method of cleaning your blinds through the use of sound waves. Ultrasonic cleaning is fast, efficient, and completely safe. No dangerous chemicals or moving parts are involved in the cleaning process. Within our ultrasonic cleaning tanks, transducers create sound waves which produce millions of microscopic bubbles that implode (not explode), creating a vacuum that pulls dirt particles from an object. Because these bubbles are so small, every nook and cranny is cleaned, along with the most stubborn dirt and stains. Not only does ultrasonic cleaning improve the appearance of your blinds, but our process improves the quality of your home or office environment as well. 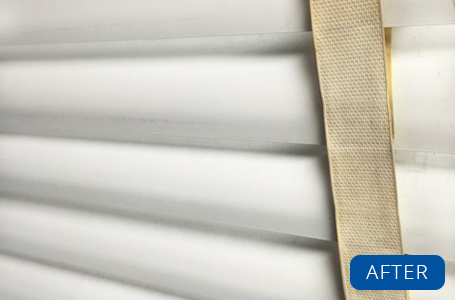 Our trained professionals aren’t coming to your home to merely dust the slats of your blinds. 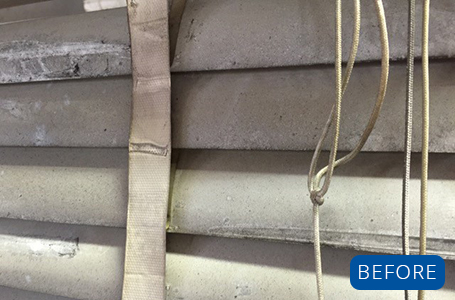 Through precise attention to detail, we clean cords, bars, rails, and all of the hard to reach places as well. After one appointment, you’ll quickly realise why we’re the best in the business. If you’re in need of new blinds, installation, or blind repair services, contact our office so we can handle everything in one full-service appointment. Working around your schedule, Jim’s Cleaning brings quality professional blind cleaning service directly to your doorstep through the use of our fully loaded mobile cleaning trailer. 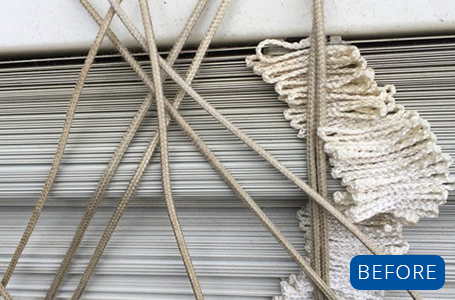 When we arrive at your location, our staff will be prepared with everything we need to leave your blinds in impeccable condition. 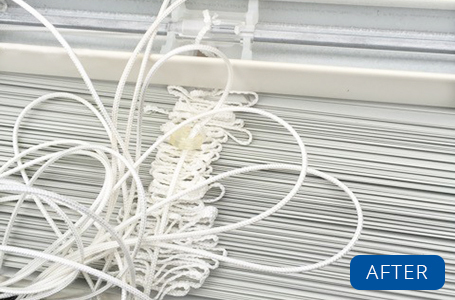 While there, we’ll remove, clean, and re-hang your blinds without ever requiring you to lift a finger. If your days are really busy, our Pick Up and Delivery service is a convenient way to take advantage of professional blind cleaning without impacting your day. We’ll send someone out to pick up your blinds and we’ll drop them back off after we’ve finished cleaning them. Off-site appointments are yet another way Jim’s Cleaning goes above and beyond for our clientele. Bring your blinds to us when you’re on your way out and pick them back up after we’ve cleaned them. Leave your blinds with us in good confidence, Jim’s Cleaning is the best in the business. Material and fabric blinds, casual romans, holland blinds, honeycomb & pleated blinds, vertical blinds, vertical sunscreens, plantation shutters, metal blinds, plastic blinds, venetian blinds, aluminium blinds, timber & wooden blinds, micro & slimline blinds, dual roller screens, roller screens, cellular blinds and sheerview blinds. What type of blind do you have? Call Jim's today for clean blinds!